john napier (1550-1617) - logarithms. More about napier's bones - what were they & how were they used? henry briggs (1561-1630) - logarithms. This is the story of numbers, our love-hate relationship with them, but in particular, it is the story of the attempts to tame them, to make them more manageable. The earliest recorded use of numbers and arithmetic is found on clay tablets from Mesopotamia (more or less equivalent to modern day Iraq). These tablets are more than 4500 years old, from the dawn of civilised urban existence and they deal with, guess what - accounts and tax records! Paying tax is surely one of the greatest joys of civilisation. Most early societies were hampered by the lack of a suitable way of expressing numbers. The Greeks, famed for their geometry, but not so good at algebra, used letters of the alphabet. The Romans had a particularly hideous system. These look pretty on a modern clock dial, but are useless otherwise - try multiplying XXVIII (28) by XXVI (26) to get DCCXXVIII (whatever that is). Numbers still had to be used in daily life and the problem with the symbols was solved to some extent by simply ignoring it. Counters were used instead. The counters were first used on their own, in heaps, then sliding in grooves made in in a table, then strung into a framework. This device, the abacus (from abax, Greek=tablet or table), allowed people to do arithmetic without bothering with the symbolism, they manipulated an analogy, not an abstraction. However, like the modern day calculator, the abacus was good at getting an answer, but useless in helping any mental process - a good abstract symbolism was still needed so that people could think about the numbers themselves. The Hindu civilisation of India was alone among the ancients in developing a usable representation for numbers and this perhaps 2000 years ago. More importantly, about 1500 years ago, they developed the concept of ZERO and with it the idea of place value. This enabled them to develop a high degree of skill in algebra. At the end of the classical period, Europe entered a mathematical and scientific dark age, lasting hundreds of years. During this time, science and mathematics were kept alive by Arab scholars, who assimilated the Greek and Hindu traditions. Baghdad was a major cultural centre and it was there that Mohammed ibn Musa al-Khowarizmi wrote a book about the Hindu numbers and gave instructions on how to use them. He also wrote ilm al-jabr w'al muquabalah or "the science of reduction and cancellation". We get our word algebra from the al-jabr in the title; we also get the word algorithm from the Latinised version of al-Khowarizmi (Algorismi or Alkarismi - spellings vary). The knowledge accumulated in the schools of Baghdad seeped slowly into Europe, brought by people such as Adelhard of Bath (who translated Euclid's Elements and some of al-Khowarizmi's tables) and Leonardo of Pisa. Leonardo was the son of Bonacci, a merchant and so is also known as Filius Bonacci or Fibonacci. Fibonacci is famous for his book Liber Abaci, 'The book of the Abacus' and for the Fibonnaci number sequence. This next is an irrelevant aside, (but a good story). Despite the introduction of a decent way of representing numbers, old habits die hard. In the UK, tax returns and demands were handled, particularly in rural areas, by means of tally sticks, literally wooden sticks with incised cut marks. This is understandable in the 14th and 15th centuries, perhaps, but the practice continued up to 1828! The sticks were stored in the Parliament buildings in London. In 1834, the records were no longer required. Possibly because they were official records, or a state secret, they coundn't just be given away as fire wood. Instead, they had to remain within the Parliament buildings and be burnt officially. Unfortunately, the resulting official blaze got out of control and the Parliament buildings were burnt to the ground. The present Houses of Parliament are a modern replacement. So, having got that bit of foolishness out of our system, back to the main story. Round about the beginning of the 16th century was a time of massive expansion of marine travel and the arts of navigation and astronomy were to a great extent stimulated by this. It was a time of extraordinary effort of calculation. The astronomer Kepler, for instance, spent 20 years calculating; working towards the formulation of his laws of the motions of the planets. The labour was never-ending. The problems with multiplication, division and extraction of roots were mind-boggling. John Napier's invention of logarithms and the subsequent publication of tables dramatically reduced the effort involved in the calculations of the day. By using logarithm tables, multiplications were reduced to addition and divisions to subtractions. Logarithms were the single most important aid to calculation for the next three hundred years. Up until the 19th century, log tables and the slide rule, a form of analogue calculator, ruled supreme. The tables could give accurate answers, but were slow to use. The slide rule was fast, but gave only approximate answers. By the middle of the century, reliable four function calculators had arrived and Charles Babbage had envisioned a universal calculating engine, a computer by another name. All that was necessary was to wait for technology to catch up with the dream. The woodcut illustrates two aspects of arithmetic. On the left calculation is performed by the manipulation of abstract symbols (numerals) and on the right calculation is performed by the manipulation of small stones on a table. The very word "calculate" comes to us from the Latin calculus, a small stone. 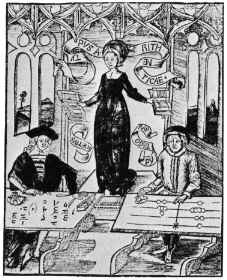 By the time that this illustration was first published, the abacus had been in use for many hundreds of years. Although very useful for addition and subtraction, the abacus was not a great deal of help with either multiplication or division. These were a great problem. It is a difficult process to multiply and, in particular, to divide large numbers without some form of aid. For a very long time no effective aid was available. John Napier, Baron of Merchiston invented and publicised a system of "logarithms" which allowed multiplication and division to be reduced to addition and subtraction. This vastly reduced the effort required to perform calculations. Although Napier is now famous as a mathematician, this was his spare time activity. He considered his major achievement to be his studies of the Book of Revelation as outlined in his work A Plaine Discovery of the Whole Revelation of St. John. Posterity does not agree with his judgement. "...calculation led Justus Byrgius on the way to these very logarithms many years before Napier's system appeared; but being an indolent man, and very uncommunicative, instead of rearing up his child for the public benefit he deserted it at birth." Napier's ideas, on the other hand, were widely published and distributed. His Mirifici Logarithmorum Canonis Descriptio, 'A Description of the Admirable Table of Logarithms', generally known as the Descriptio, was published in 1614 (in Latin) and an English translation by Edward Wright was published two years later. Napier did, however invent the word Logarithm. He had originally referred to logarithms as "Artificial Numbers", but later coined the word, basing it on the Greek logos ratio and arithmos, number. Napier spent 20 years calculating to produce his version of logarithms. These are very different to modern logarithms and they are NOT the same as the so-called "Naperian Logarithms", which, although they bear Napier's name, were not produced until after his death. Late in life, Napier developed a calculating aid, Napier's Bones, which had nothing to do with logarithms, although the two are often confused. TELL ME More about Napier's Bones - What were they & How were they used? "Napier, Lord of Markinston hath set my head and hands at work with his new and admirable logarithms. I hope to see him this summer, if it please God; for I never saw a book which pleased me better, and made me more wonder." He did make the visit in the summer of 1615, and stayed with Napier for a month. The next summer, he visited Napier again. Between them, it was decided to change the form of the tables, so that the logarithm of 1 should be zero. This required the complete recalculation of the tables. Napier was in poor health and not able to carry this out. He died in 1617, just before Briggs' projected third visit. It was left to Briggs to recalculate the tables, to produce the now more familiar base 10 logarithms. He published a part-finished set of tables in 1624. This contained the logarithms of the numbers 1 to 20,000 and 90,000 to 100,000. A Dutchman, Adrian Vlack, filled in the missing section and his tables were published in 1628. Logarithms are arguably the most important single aid to calculation ever produced. For 300 years after their invention, logarithm tables were used in calculations more than any other device. It is only very recently that they have been replaced by electronic calculators. Many sets of tables were produced subsequently, their authors usually claiming them to be the product of new calculations. However, several of these were blatant copies of the tables of earlier workers complete with their errors!. Years later, Charles Babbage made a comprehensive study of these errors. He found the same six errors (and many different ones) in each of thirteen set of tables published in London between 1633 and 1822 and also in tables published in France, Germany, Italy. Even in a set of Chinese tables. These six errors (with others) were in Vlack's original 1628 tables! All had been copied! The copiers also frequently introduced their own new errors in addition to ones that they had copied from Vlack.
" It is confidently believed that the cases where error exceeds ±0.51 units of the last decimal could be counted on the fingers of one hand; those that are known to exist form an uncomfortable trap for any would-be plagiarist"
Edmund Gunter inscribed a logarithmic scale on a two foot ruler. By marking off lengths on this rule with a pair of dividers it was possible to perform multiplication. He published a description of this device in 1624 in his book Description and Use of the Sector, the Crosse-Staffe and other Instruments. There is a Gunter Scale inscribed with its maker's name Thomas Tuttell, Charing Cross Londini fecit in the National Maritime Museum at Greenwich, London. The 'Gunter' as this type of rule was known, is an important precursor to the slide rule. William Oughtred Produced the first true slide rule in 1632 by mounting two Gunter scales side by side. It was then possible to read directly from one scale to the other, thus eliminating the need to use dividers. He also wrote a text book of arithmetic Clavis Mathematicae in which the × sign (for multiplication) was used for the first time. The modern form of the slide rule, complete with the sliding glass cursor, was perfected by Amédéé Mannheim in 1850, while he was a student in Metz.